You love your hearing aids, but do you know how they work? Hearing aids are complex little pieces of technology! Today, we are going to take a look at the directional microphone, one of the most important elements of many hearing aids. As you can probably tell from the name, a directional microphone picks up sound from specific directions. Some microphones are omnidirectional, meaning they collect sound from every direction equally. 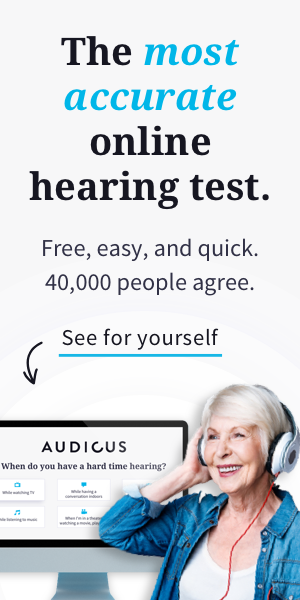 This can be disadvantageous when you’re dealing with hearing aids, however; it is not helpful to have background noise as loud as music or speech. Directional microphones inside hearing aids are more sensitive to picking up sounds in certain directions and allow hearing aid wearers to focus on certain sounds—specifically the most important sounds that they want to hear. Why Do I Need a Directional Microphone? Ears unaffected by hearing loss are able to automatically and instantly filter out background noise and other non-important environmental sounds. This function allows people to focus on speech or other important sound signals around them. You may have heard of the ‘cocktail effect’: If you’re in a noisy place, you’re still able to hear someone say your name at normal volume. This is because your brain and ears are working together to ignore background noise and listen harder for the important stuff. People with hearing loss, however, are not able to easily distinguish between important and unimportant sound signals. That’s when the directional microphone comes in handy, and replaces that lost filtering ability so you don’t hear every single sound equally. How Do Directional Microphones Work? There are a few ways that directional microphones can function. A microphone can be made directional by adding ports on both sides of the sound-receiving sensor. Sounds that come from both sides, which is most often background buzz, cancel each other out and allow the listener to concentrate on sounds coming from one direction. The most advanced directionality comes from using multiple microphones. With two or three microphones, the directionality is improved because the shorter distance between microphones allows them to be hyper-selective about which sounds to cancel and which sounds to concentrate on. Which Hearing Aids Have the Best Directionality? By now, you want a hearing aid with great directionality. But which one should you choose? This is really up to the individual wearer—there is no consensus on which type of hearing aid has the best directional microphones. Some brands have been using directional microphones for longer than others, but they might not work best for you. The best way to approach directionality is to discuss with your audiologist or hearing aid provider and ask their opinion about what would suit your needs the most. I have the Dia II Hearing aid. Does that have a directional microphone or is that something extra you can buy to add somehow to your earring aid. Not sure how this works. Thank you for your help. how well do your hearing aids work with a severe hearing loss condition? Hi Dennis! We have many customers who have severe and even profound hearing loss, and have our hearing aids. It all depends on which model you get though, since we have different models that correspond to different types of hearing loss. Give us a call at 855-971-0451 or shoot us an email at [email protected] and we can chat about what options would be best for your hearing needs!